Since 1981, nearly a half-million wild Blue-fronted Amazons (Amazona aestiva) have been traded on the international market. Over-harvesting and habitat loss have caused local extinctions that have contributed to the overall decline of the species in the wild. WPT also supported the research of biologist Dr. Igor Berkunsky starting in 2007. One hundred and forty-eight Blue-fronted Amazon chicks were confiscated from illegal trade in October 2010. The Brazilian NGO SOS FAUNA, provided the first emergency care; the chicks were later transferred to their Rescue Center in the state of Mato Grosso do Sul (CRAS-MS). The World Parrot Trust’s FlyFree program contributed financial support for this emergency rescue. 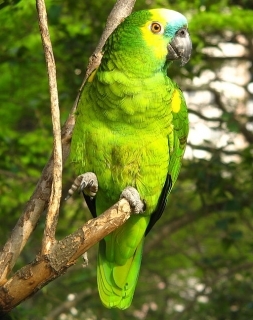 Focus of future work: WPT is currently working with the Projeto Papagaio da Caatinga to rehabilitate confiscated Blue-fronted Amazons as well as species of parakeets and conures caught in illegal trade. As of 2018, 289 Amazons had been released back to the wild in two protected areas. Where found: A.a. aestiva: E Brazil, from Pernambuco and S Para to W Sao Paulo and S Mato Grosso. A.a.xanthopteryx: S Mato Grosso and formerly W Rio Grande do Sul, Brazil, N and E Bolivia, and Paraguay to N Argentina; mixes with aestiva in NW Paraguay, S Mato Grosso, and NE Argentina. History: The Blue-fronted Amazon (Amazona aestiva) is trapped in large numbers for the wild bird trade but while it is still in some areas, in others it is locally extinct. The International Union for the Conservation of Nature (IUCN) is revieving its status, currently listed as Least Concern. Since 1981 when it was listed on CITES Appendix II, hundreds of thousands of wild-caught individual Blue-fronted Amazons have been recorded in international trade. The trapping of Blue-fronted Amazon is the only harvest of a wild bird anywhere which claims to be sustainable. WPT by 2005 had ascertained that it is not, and let officials in the EU and USA know how unsustainable their harvest is in practice (Berkunsky, 2005). Ecology: The Blue-fronted Amazon is found in a range of wooded habitats and open country with trees, up to an altitude of 1600m (5248 ft) in E Bolivia. Birds take fruit and seeds from wide variety of plants and trees. They are seen in communal roosts and are found in pairs or flocks of several dozen birds, sometimes quite close to human habitation.